Beloved and I had dinner a couple of times this past week at π Breakfast and Pies. This is a new place found at Malingap Street, at UP Teacher’s Village. This place is located beside Pino and Pipino. In fact, I believe this place is owned by the owners of the aforementioned place, as well as BRGR: The Burger Project. Since we’ve been to these places and had pleasant experiences, we had quite high expectations of the place, even if it has just opened up, I believe just a week ago. It’s pretty obvious what their specialty is: Breakfast and Pies. The first time we went, their Menu didn’t have permanent prices, all just penciled on. However, it was pretty much complete with what you expect from breakfast—pancakes, waffles, corned beef, bacon, et cetera. They, of course, also have a big enough selection of pies. Since both Beloved and I enjoy waffles the most for breakfast, we ordered their Gourmet Waffle Chicken and Waffles (205 Php 165 Php). In addition, we also ordered their Steak and Eggs (625 Php 595 Php). Now, it’s usually Beloved who gets more excited with the drinks. This time around, however, I noticed a peculiar drink in their menu. 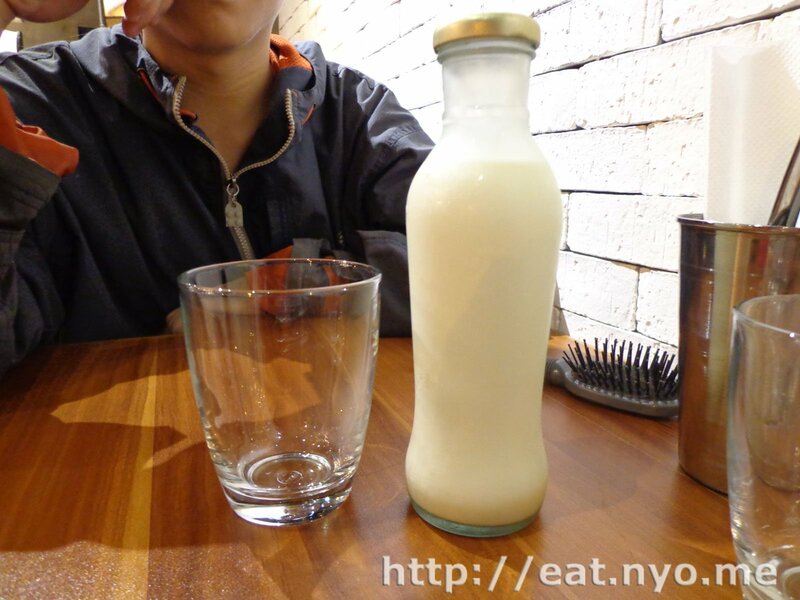 I immediately ordered that: their Cereal Milk (75 Php 125 Php). Beloved settled for their Celery Cranberry Juice (75 Php). 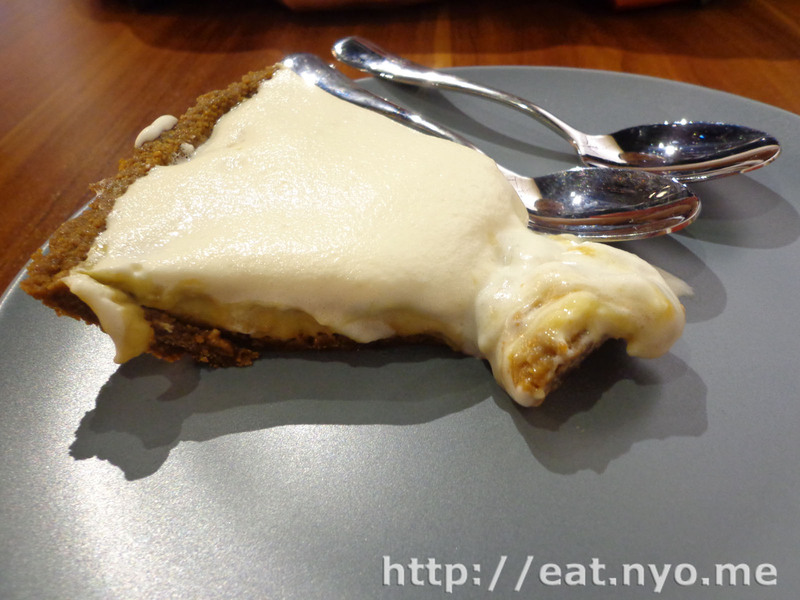 Finally, we also tried their Banana Cream Pie (105 Php), just so we can experience the full… uh… experience. 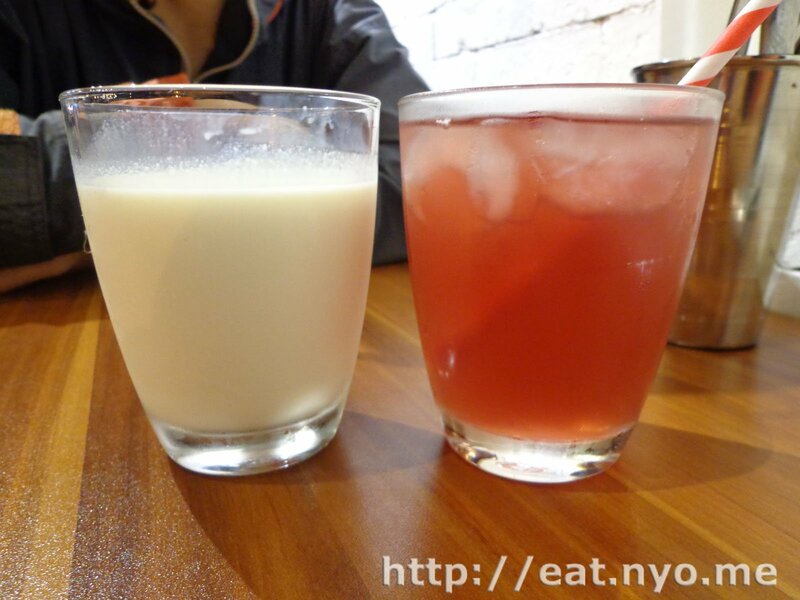 Behold, π Breakfast and Pies’ Cereal Milk. I’ve never had anything like this before in a food place. Anyway, if you’ve eaten corn flakes with milk before, you’ve probably tasted this. It’s basically that, without the corn flakes. I found it quite amazing and addicting. Anyway, they served an entire bottles worth, filling the glass twice, lasting me the entire night. Beloved didn’t find my drink amazing, nor did she like it, actually. But I guarantee, those who enjoy cereal would find this enjoyable. Beloved also didn’t enjoy her Celery Cranberry Juice as much. But that’s because it was on the sour side, and the only sour dish she enjoys is sinigang. I found it okay, but my drink was far more superior. A bit unfortunately, our Banana Cream Pie arrived before our main dishes, since it was already prepared. It wasn’t also cut perfectly, but I didn’t really mind a lot. Beloved enjoyed this dish a lot, finding the crunchy-chewy crust superb. The filling itself was mostly cream, but the bananas were certainly present in an almost paste form, making it quite palatable and enjoyable with the difference in texture. It’s also not as sweet as other pies I’ve had the pleasure of trying, making this the better pie once they learn to cut it perfectly. 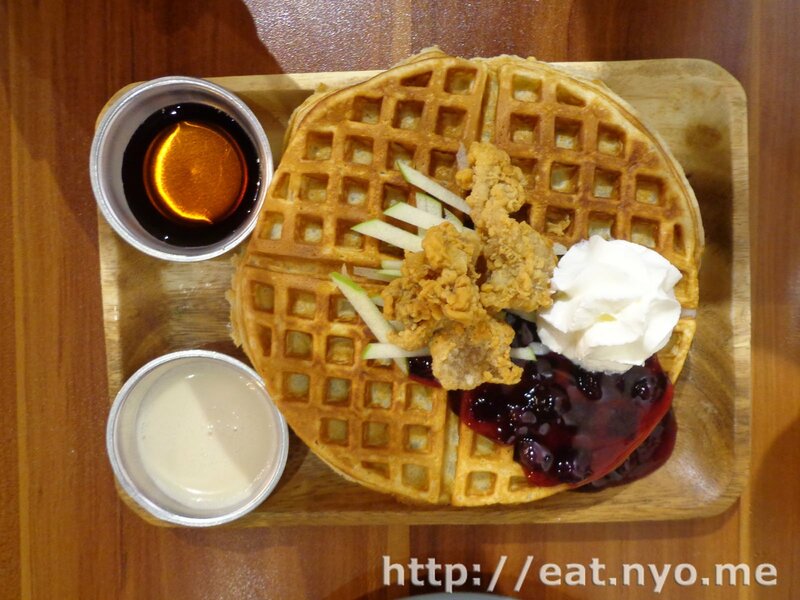 The first of our breakfast dishes, the Chicken and Waffles, consisted of two pretty sizable waffles topped with blueberries, granny smith apple julienne strips, and fried chicken skin. The waffles themselves had corn and jalapeno inside. I was a bit disappointed that it wasn’t crunchy as Beloved and I would’ve liked our waffles to be. I also found the toppings a bit meager considering the tag. Nevertheless, they were quite interesting, especially with the hot aftertaste from the jalapeno inside. They also included maple syrup and sour cream for the waffles syrup traps, which I took quite the advantage off to make up for the texture I would’ve preferred. Next is our Steak and Eggs. 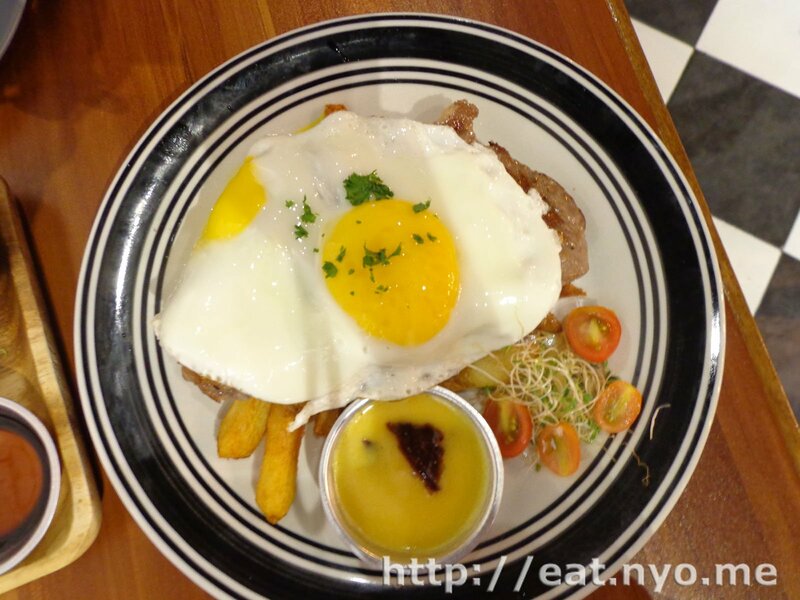 The sizable, thick steak was buried underneath a sunny-side up egg, along with fries and cherry tomatoes with alfalfa. According to the menu, this was a strip loin of kitayama wagyu beef. Honestly, this was my first time hearing this brand of wagyu, but I do know that wagyu is prized for its marbling, so I expected a soft meat. It was indeed soft, especially since we ordered it medium rare. However, I didn’t really find it all that special, maybe because I’m comparing it to Snack Shack’s divinely juicy beef and their respective price tags. Or maybe I should’ve asked it to be a bit more done, since I enjoy my steaks well seared on the outside but still rare on the inside (which is how I expect medium rare steaks to be). Anyway, another interesting fact about the dish were the fries, which, according to the menu, were deep-fried in bagnet fat. The eggs were done quite nicely, too. Although what we had was already quite hefty, we still had room in our tummies for dessert (even though we technically already had one). 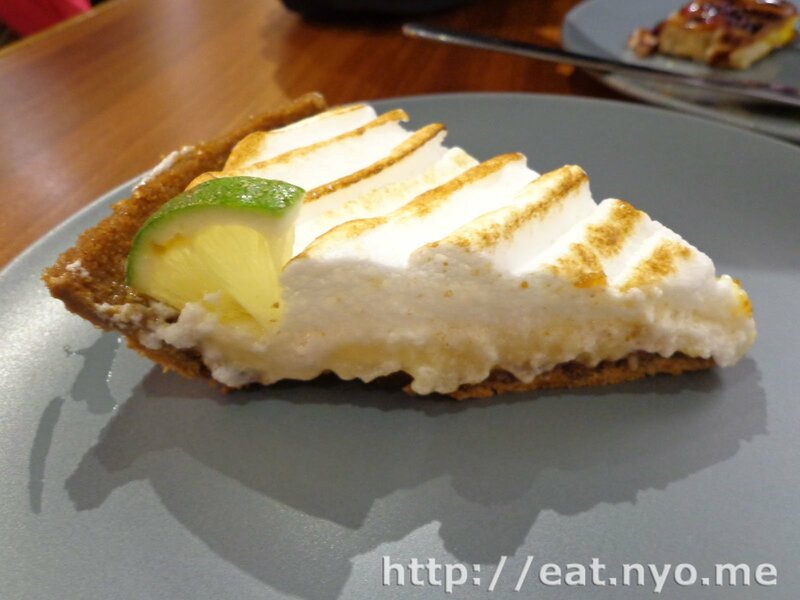 I convinced Beloved to try out their Key Lime Pie (135 Php). I’ve had the pleasure of trying out this kind of pie before, and it was quite sour, almost devoid of sweetness. Like their Banana Cream Pie,Â the crust made the dish spectacular. There was enough of the key lime paste on every bite. While I found this not as sour as I expected, it was actually very good. It had just enough sweetness and sourness, and neither overpowering each other. Delicious! It was Wednesday when we tried it out, and we were quite pleased with the pies. 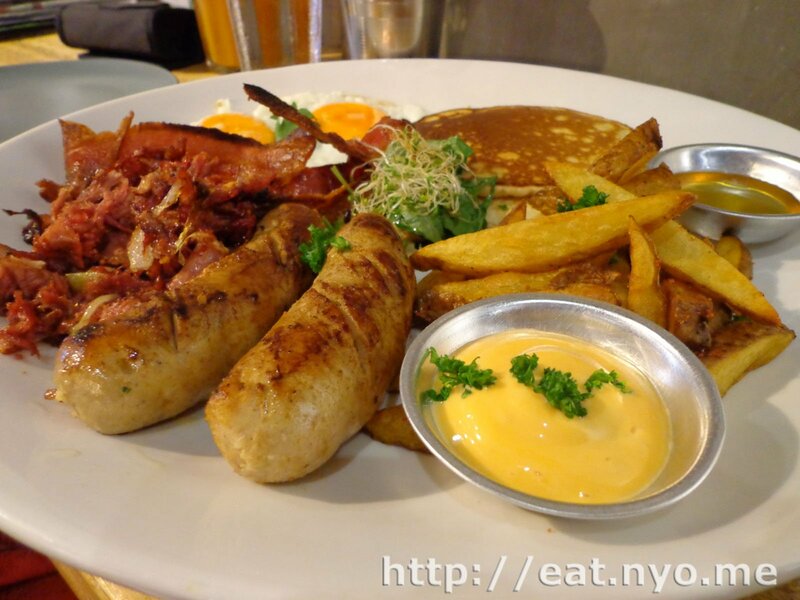 With the Breakfast dishes, not as much, but that was just because of personal preferences. We decided to go back on Friday since the particular waffle dish we wanted to try wasn’t available. There was a bit of a shortage of seats, and we settled for their bar table. Luckily, there was no shortage of the dish we wanted to try this time—their Salmon and Waffles (175 Php). If you noticed earlier, I crossed out prices, well, that’s because when we went on Friday, their prices changed. It was nice that they lowered the price of their waffles from 205 Php, but I was quite surprised that their Cereal Milk raised to a whopping 125 Php from 75 Php. I still ordered it, though. Beloved ordered the safest drink from their menu, the Iced Tea from Pino (65 Php). Finally, since we know we won’t be full with just their waffles, we also ordered the most expensive item in their menu (not counting entire pies), their π Platter (625 Php). 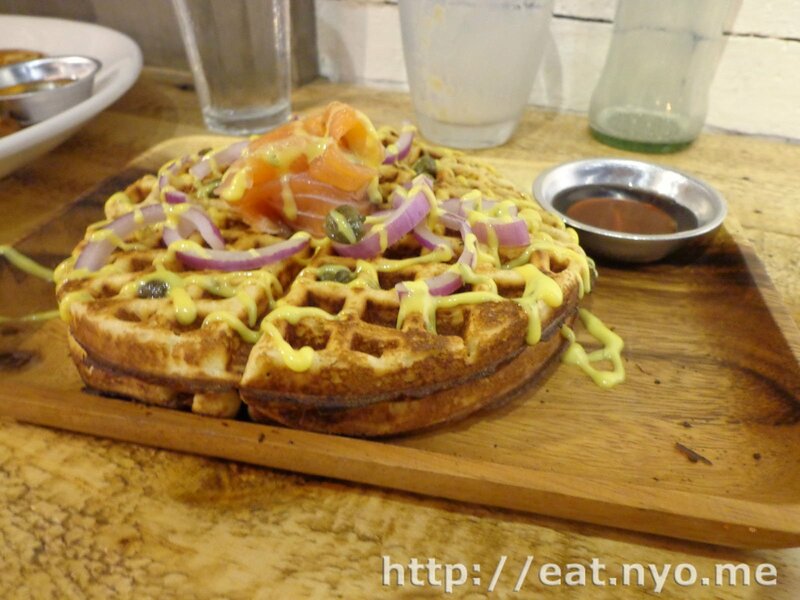 The style of serving was similar to their Chicken and Waffles, the Salmon and Waffles has smoked salmon, onions, and capers. This time around, there wasn’t any bits inside that made it taste unusual. However, it was still quite unique since this was the first time I’ve had smoky salmon on waffle. So, without the maple syrup, this was a bit on the salty side, with a hint of spiciness from the onions. The sauce, according to the menu, was a sort of dill honey mustard, but the prominent taste was that of the capers and salmon. Sadly, it still wasn’t as crisp as we would’ve wanted, though it was still pretty good. While I would’ve wished there was more salmon, the slashed price tag makes up for it. The more expensive π Platter consists of basically most of their breakfast items on their menu minus the specialty eggs (Eggs Benedict and omelettes) and anything else with starch except for fries. Clockwise from the top, there’s pancakes, their bagnet fat french fries, honey and sriracha mayo, hungarian sausages, corned beef, bacon, a couple of sunny-side up eggs, and a mushroom-spinach-alfalfa salad. This was a dish good for two and in fact, with the waffles, Beloved and I barely managed to consume everything. Everything was nice. Particular mention for me are the corned beef, which are juicy strips of beef, crisp on the edges, which I found much better than the steaks. Both Beloved and I agree, however, that there’s too little mushrooms in comparison to the rest of the dish. As I mentioned, we no longer had space this time for our tummies. However, since this place had spectacular pies, we settled for their cookies instead for dessert. We ordered their Lace Cookie with Dark Chocolate (35 Php). It was pitiful on its own, but it’s all we could manage. 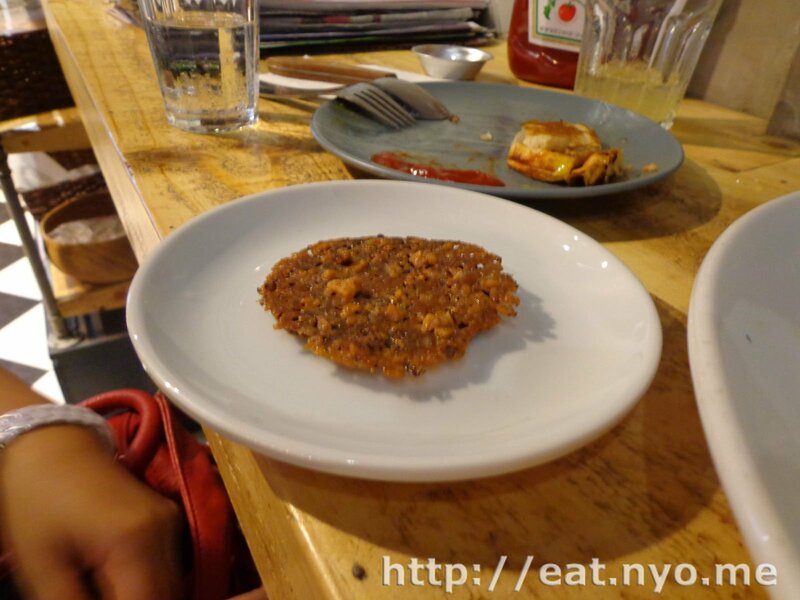 It had a very chewy texture, and not very sweet for a cookie, or a dessert for that matter. Like their pies, I enjoyed this much more than their breakfast dishes. Now, that doesn’t mean that I didn’t like the “Breakfast” part of π Breakfast and Pies. I just preferred the “Pies” part. The service was also a bit flaky. I noticed they don’t have a designated cashier and our bill took longer than our pies. But that’s understandable since it’s barely a week and there’s still a bit to learn. Overall, however, it’s a solid start, especially with their pies. It’s also nice to know that you can go here form 7am to 10pm and actually have your first meal of the day. It’s not a budget breakfast places, but if you want a real breakfast that would definitely give you enough juice to last your day, π Breakfast and Pies is definitely worth the visit. Recommended for: Pie lovers; Hefty Breakfast lovers. Not recommended for: Pie haters; Not-so-hungry passersby. Smart nomnomnom tip: Some of their breads are 50% off 8pm onwards.